So you’re passionate about songwriting and you want to make a career out of it but you don’t know where to start? Are your songs ready for prime time? How do you demo them? How do you pitch them when they are ready? Balancing the art and commerce of songwriting is a constant challenge but you don’t have to do it alone. "Dare To Demo" is designed to help you get your songs – and yourself – ready for a professional studio demo. It includes lots of practical, no nonsense advice on pre-demo preparation. "Studio Standout" is all about helping you take full advantage of your time in a professional recording studio so that you come away not only with a great recording but a great experience. "Pitch Perfectly" will help you take your professionally recorded demos through the labyrinth of the music industry by teaching you how to pitch your songs and, ultimately, get them cut. "Creating A Career" consists of detailed insights from Cliff’s quarter of a century’s worth of experience as a pro songwriter on how to build a business and a career around songwriting. Gain an insider’s perspective on the music industry as it is (not as it was). A one-hour phone or Skype session with Cliff on the topic/topics of your choice. Click the button below to book your consultation. Learn how to get your songs professionally recorded and pitch-ready without any prior recording studio experience. You’ve got the songs, they’re ready for prime time and you’re ready to have your songs professionally recorded but don’t know where to start? Should you record your demos yourself? How do you find a good studio? Where do you find the vocalists and session players? Once you’ve got your demos done, how do you get them heard? Getting professional demos recorded can be one of the biggest challenges up and coming songwriters face. Don’t let this stop you from pursuing your passion. 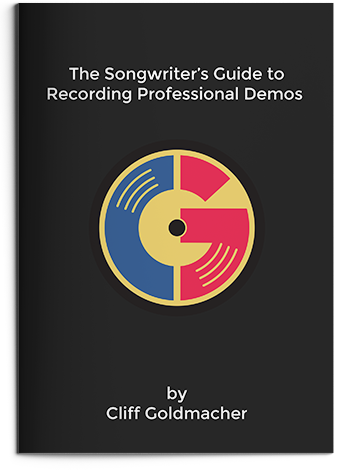 The Songwriter’s Guide to Recording Professional Demos takes the guesswork out of the demo process. The eBook companion pages include before/after audio examples removing all doubt as to what a professional demo should sound like. Reduce Stress by learning how to find a good studio, hiring great musicians and preparing in advance. Save Time by learning what to outsource and what to do on your own. Get Results by learning how to pitch your broadcast-quality demos to anyone in the music industry. CLICK HERE to get a free trial membership!